While I’m off getting married, several of my beloved blogging buddies are stepping in to share some recipes so that you, my wonderful readers, don’t get too lonely (or hungry). Today’s post comes from one of my favorite food photographers, recipe sharers, and human beings in general. Erika and I share a penchant for chocolate, Paris, and masochistic graduate school programs, or so I realized when she mentioned that she had enrolled in an MBA program this past summer. As though we needed something more to bond over! A student by day, Erika runs The Pancake Princess by night/weekend/whenever she doesn’t have class or other school obligations, and it is truly a work of art. The recipes are varied and creative, with a healthy-but-not-holier-than-thou bent; the writing is personal enough to be relatable, but without being uncomfortably intimate, and still informative and relevant to the actual food. And her photos take my breath away, so much so that I actually thought twice about asking her to guest post because I was afraid that after you saw her pictures, you’d never want to look at mine again. I hope that doesn’t happen, but just in case, let’s all distract ourselves with cookies! So Nora got married. We’re making cookies. Do these seem like equivalent events? It’s essentially the same thing minus the dress and lots of relatives plus an oven and flour all over the place and swapping cake for cookies and classy wedding music for the Katy Perry Pandora station. Right? Anyway, let’s all clap our hands and squeal for a second because weddings and honeymoons are exciting stuff. !!!!!!!!!!!!! 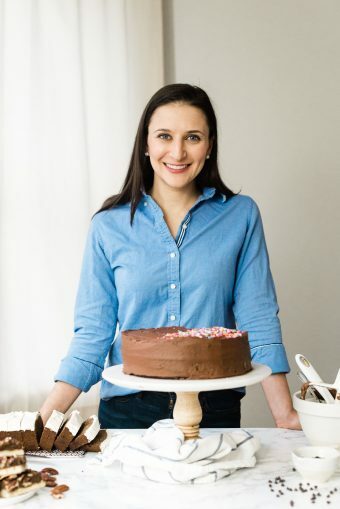 Nora holds a place near and dear to my heart not just because of her amazing recipes, but also because she has already gone through an MBA program and talked me down (via amazing email chains) from a few emotional ledges that I was teetering around on before I started my program a few months ago. She understands, y’all. Back to the cookies: I have to do a complete disclaimer and say right now that I’ve never actually tasted the soft-baked cookies these are based on. Developing this recipe came about at the request of my friend, who was consuming them by the box (literally. By the box.). By her account, these are as good as the real deal with nearly identical nutrition facts: about 130 calories per cookie with approximately 5 grams of fat and 3 grams of protein. Unfortunately (or fortunately) for me, once I tasted a cookie fresh out of the oven, I had no desire to go buy a box to compare them for myself. 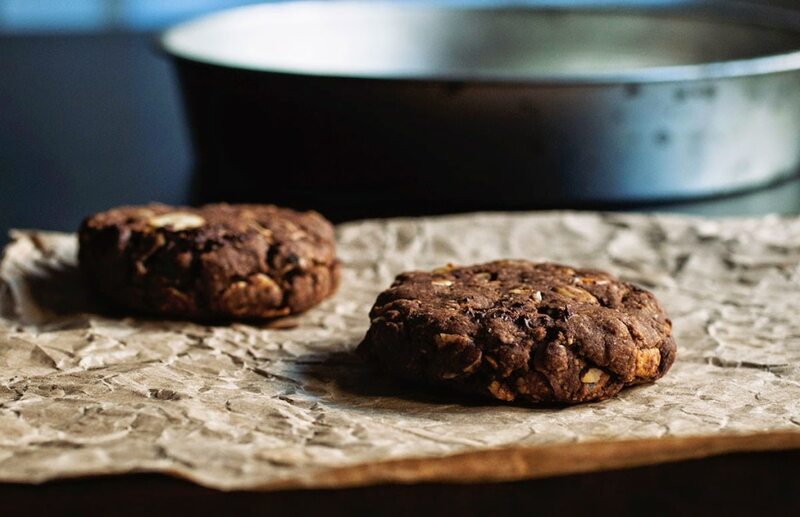 These hearty, grain-packed cookies have tons of texture from chewy oats, crumbly-soft cookie bits, crunchy nuts, and melty chocolate. They’re very reminiscent of a chocolate granola bar and I have no shame eating them for breakfast. And while we’re on the subject of chocolate and eating cookies for breakfast, let’s cross our fingers and hope that Nora is doing all of that and more on her honeymoon, because that awesome lady deserves it! Preheat the oven to 350 and line a baking sheet with a nonstick pad or parchment paper. Set aside. In a medium bowl, whisk together the honey, coconut oil, almond butter and vanilla. Add the next five ingredients (rolled oats through salt) and mix until just combined. Fold in the chocolate chips and almonds. Scoop a scant 2 tablespoons of dough per cookie to form 12 cookies. Flatten into a circle—they will not spread in the oven. Bake for 12-13 minutes, or until the tops look dry. Remove and let cool completely before serving or storing in an airtight container at room temperature for up to 3 days. You can make these gluten-free by using all buckwheat and oat flour, but they will be slightly more crumbly with less of the soft-baked feel. 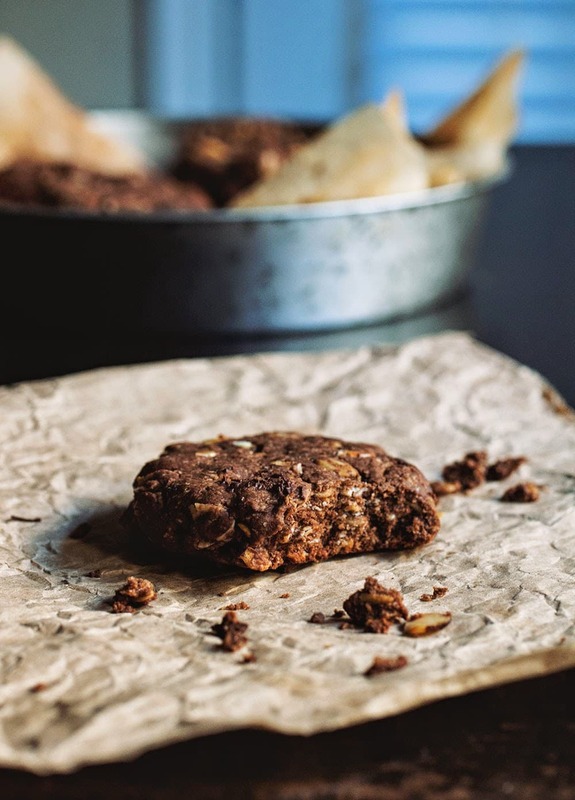 You can also try using brown rice flour for a portion of these cookies (the same note about crumbliness still applies)—the total amount of flour just needs to add up to ¾ cup. If you only have whole wheat flour, feel free to use just that. 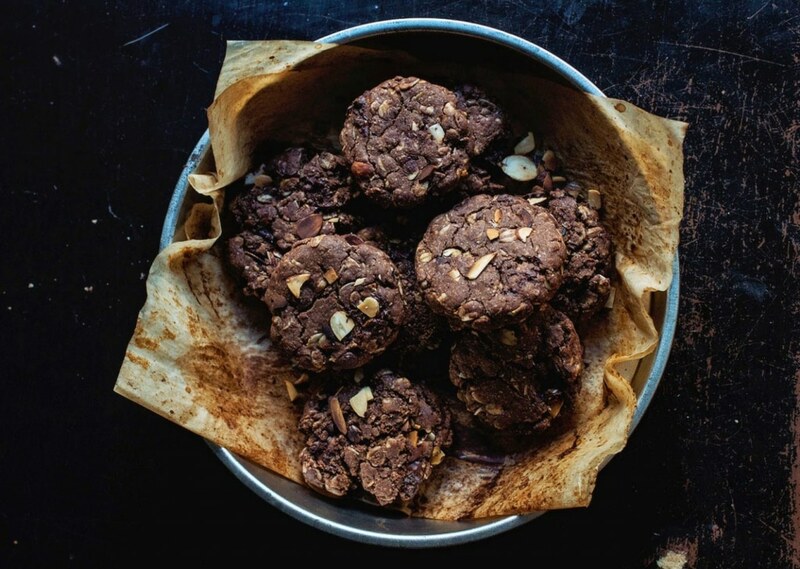 These cookies are very forgiving when it comes to flour substitutions. I’ve also tried subbing olive oil for the coconut oil, but I got the best results by following the recipe as written. There is no temp setting for the oven!! Help! Oh no! Since it’s a guest post, I’m not totally sure, but I would make an educated guess that it’s 350. I’ll confirm and get back to you! Sorry about that! [Update] Hi! I confirmed with the original recipe author that it is 350F. The recipe has been updated. So sorry about that! what can I substitute for coconut oil? I don’t use coconut oil but I do have light and extra virgin olive oil. Can I use either of those? Hi Prajakta, I would advise substituting butter, actually. The difference between coconut oil and olive oil is that olive oil is liquid at room temp while coconut is solid. 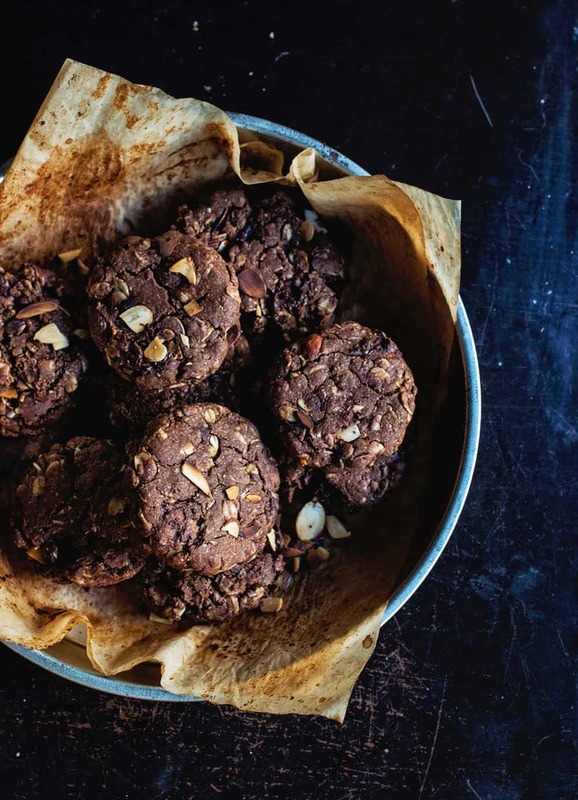 So, using olive oil would most likely result in cookies that never quite firm up after baking. That’s just a guess. But I think you’d be safer replacing the coconut oil with another solid-at-room-temp fat. Butter or vegan butter would probably be good bets. Just to warn you, I haven’t tried this substitution though, so let me know how it turns out! I hope it works for you. These are fantastic!! Sooo delicious. Thanks for an incredible healthy recipe! are you sure its not baking powder instead of soda? I don’t think so (this is a guest post, so not my recipe), but several readers have made these successfully as written. Why do you ask? ignore my last comment lol! it came out great w/ a few tweaks….i made it totally vegan w/ chia “eggs”, carob powder instead of chocolate (cant eat chocolate anymore because of migraines), rapadura sugar and stevia instead of honey….next time i will use agave…thank u so much for this recipe! Oh great! So glad to hear these worked out! !